For other uses, see Death row (disambiguation). In the United States, prisoners may wait many years before execution can be carried out due to the complex and time-consuming appeals procedures mandated in the jurisdiction. The time between sentencing and execution has increased relatively steadily between 1977 and 2010, including a 22% jump between 1989 and 1990 and a similar jump between 2008 and 2009. In 2010, a death row inmate waited an average of 178 months (roughly 15 years) between sentencing and execution. Nearly a quarter of inmates on death row in the U.S. die of natural causes while awaiting execution. There were 3,125 people on death row in the United States on January 1, 2013. 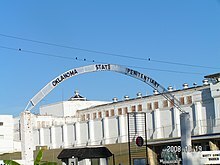 Since 1977, the states of Texas (464), Virginia (108) and Oklahoma (94) have executed the most death row inmates. As of 2010[update], California (683), Florida (390), Texas (330) and Pennsylvania (218) housed more than half of all inmates pending on death row. As of 2008[update], the longest-serving prisoner on death row in the US who has been executed was Jack Alderman who served over 33 years. He was executed in Georgia in 2008. However, Alderman only holds the distinction of being the longest-serving executed inmate so far. A Florida inmate, Gary Alvord, arrived on Florida's death row in 1974. Alvord had been on death row for 39 years when he died on May 19, 2013 from a brain tumor, having spent more time on death row than any other American inmate. The oldest prisoner on death row in the United States was Leroy Nash, age 94, in Arizona. He died of natural causes on February 12, 2010. Notes: 1Naval Consolidated Brig, Miramar is the only facility in the United States Department of Defense designated to house female Level III inmates. When the United Kingdom had capital punishment, sentenced inmates were given one appeal. If that appeal was found to involve an important point of law it was taken up to the House of Lords, and if the appeal was successful, at that point the sentence was changed to life in prison. The Home Secretary in the United Kingdom had the power to exercise the Sovereign's royal prerogative of mercy to grant a reprieve on execution and change the sentence to life imprisonment. In some Caribbean countries that still authorize execution, the Judicial Committee of the Privy Council is the ultimate court of appeals. It has upheld appeals by prisoners who have spent several years under sentence of death, stating that it does not desire to see the death row phenomenon emerge in countries under its jurisdiction. ^ "United States Department of Justice". usdoj.gov. Archived from the original on 2007-08-21. Retrieved 2007-08-21. ^ "Jack Alderman Executed". reprieve.org.uk. ^ "A man too crazy to be executed". Tampa Bay Times. ^ "BBC News - Oldest US death row inmate dies aged 94". news.bbc.co.uk. Retrieved 2016-11-01. 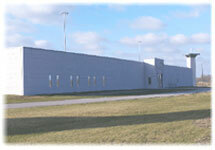 ^ "Special Confinement Unit Opens at USP Terre Haute." Federal Bureau of Prisons. July 13, 1999. Retrieved on October 3, 2010. ^ "Lisa M Montgomery." Federal Bureau of Prisons. Retrieved on October 3, 2010. ^ "Angela Johnson." Federal Bureau of Prisons. Retrieved on October 14, 2010. ^ "Annual Report Fiscal Year 2003." Alabama Department of Corrections. 33/84. Retrieved on August 15, 2010. "which also included a cellblock for 20 death row inmates." ^ "Annual Report Fiscal Year 2003." Alabama Department of Corrections. 21/84. Retrieved on August 15, 2010. "Donaldson has a death row unit with a capacity of 24 inmates." ^ "Annual Report Fiscal Year 2003." Alabama Department of Corrections. 45/84. Retrieved on August 15, 2010. "Tutwiler also has a death row,"
^ a b "Death Row Information and Frequently Asked Questions." Arizona Department of Corrections. Retrieved on December 20, 2018. ^ "State Capitol Week in Review." State of Arkansas. June 13, 2008. Retrieved on August 15, 2010. "Executions are carried out in the Cummins Unit, which is adjacent to Varner." ^ Haddigan, Michael. "They Kill Women, Don't They?" Arkansas Times. April 9, 1999. Retrieved on August 15, 2010. ^ a b "History of Capital Punishment in California Archived July 24, 2010, at the Wayback Machine." California Department of Corrections. Retrieved on August 16, 2010. "All male prisoners on condemned status are housed at a maximum-security custody level in three units at San Quentin State Prison. Females are housed in a maximum-security unit at Central California Women’s Facility in Chowchilla." ^ "Death Row FAQ." (Archive) Colorado Department of Corrections. Retrieved on April 19, 2012. ^ a b "Death Row Fact Sheet." Florida Department of Corrections. Retrieved on August 15, 2010. ^ "Georgia Diagnostic and Classification Prison." Georgia Department of Corrections. Retrieved on July 18, 2010. ^ "Inmates Under Death Sentence January 1, 2012 Changes to UDS Population During 2011." (Archive) Georgia Department of Corrections. Retrieved on November 18, 2012. ^ Barrouquere, Brett. "Inmate challenges sedatives used in lethal injections Wilson also claims state doesn't provide enough information to inmates." The Harlan Daily Enterprise. November 24, 2007. Retrieved on September 8, 2010. ^ "Kentucky State Penitentiary Prepares For 165th Execution." WLKY. Retrieved on September 8, 2010. ^ "Life After Death Row." CBS News. April 25, 2010. Retrieved on August 16, 2010. "Rideau was sent to Louisiana's Angola Prison, where he spent a decade waiting to be executed." ^ "Louisiana Correctional Institute for Women." Louisiana Department of Public Safety and Corrections. Retrieved on August 16, 2010. ^ a b "Division of Institutions State Prisons Archived 2002-12-06 at the Wayback Machine." Mississippi Department of Corrections. April 21, 2010. Retrieved on May 21, 2010. ^ Lombardi, George, Richard D. Sluder, and Donald Wallace. "The Management of Death-Sentenced Inmates: Issues, Realities, and Innovative Strategies." Missouri Department of Corrections. 8-9. Retrieved on September 18, 2010. ^ "Organization." Nevada Department of Corrections. Retrieved on September 5, 2010. ^ "Lone woman on Nevada's death row dies in prison ." Associated Press at North County Times. January 31, 2005. Retrieved on September 5, 2010. ^ a b "Death Row and Death Watch." North Carolina Department of Correction. Retrieved on September 1, 2010. ^ a b c d "CCI death row receives final inmates." Chillicothe Gazette. Retrieved on February 2, 2012. ^ a b "Capital Punishment in Oregon." Oregon Department of Corrections. Retrieved on December 28, 2012. ^ a b "Death Penalty FAQ." Pennsylvania Department of Corrections. 2 (2/4). Retrieved on July 26, 2010. ^ "Death Row/Capital Punishment." South Carolina Department of Corrections. Retrieved on July 8, 2018. ^ a b c "Death Row Facts." Tennessee Department of Correction. Retrieved on August 25, 2010. ^ "West Livingston CDP, Texas Archived June 6, 2011, at the Wayback Machine." U.S. Census Bureau. Retrieved on May 9, 2010. ^ a b "Death Row Facts Archived August 6, 2009, at the Wayback Machine." 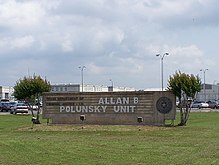 Texas Department of Criminal Justice. Retrieved on August 15, 2010. ^ "History of Capital Punishment". Death Row Conditions: Death Penalty Worldwide Academic research database on the laws, practice, and statistics of capital punishment for every death penalty country in the world.